I wrote about U.B.E or Ultimate Brownie Experience a month or so ago. 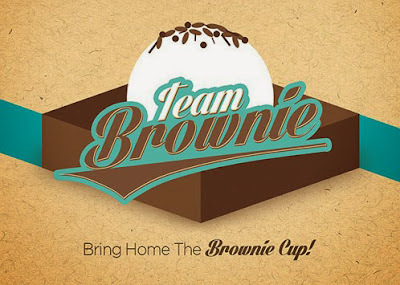 U.B.E now has a different name—Team Brownie—but with the same mouthwatering effect! :D And a new flavor to boot! Smores! Smores is dark fudge with a little extra—a big marshmallow and pieces of graham crackers. I have tried all three flavors—dark fudge, red velvet, and smores—and I still can't decide which one I like best! Everything is wonderfully addicting. I better go get my blood sugar checked. 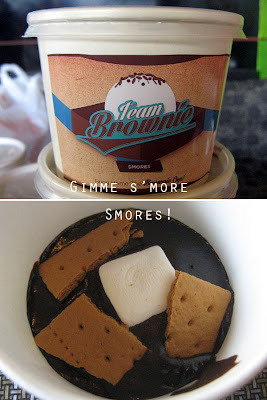 Brownie cups go for Php55 each. Minimum of five cups to order. If you're craving for one now, please put it on hold for two or three days... orders must be placed two to three days in advance. What made you want to travel? I think experience is most important. I can experience a lot of things through traveling. And I think seeing is believing. I can learn many things too, especially when I'm in a foreign country. Moreover, I can meet many new friends and get good memories. There are many reasons. Anyway, I just like to experience exciting things to make good memories. Why did you decide to study English? I wasn't able to speak English when I traveled to foreign countries before. I was able to communicate with Japanese only. Then I thought if I could speak English, I would be able to enjoy my travel more. If I learn English, I can talk to foreigners as well as Japanese. 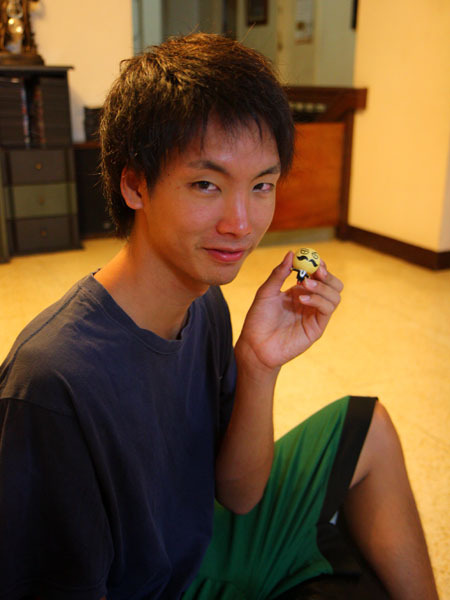 I wanted to get along with foreigners. Why did you choose to study in the Philippines? Studying English in the Philippines is cheaper than in other countries. And studying English in the Philippines is perfect for beginners, I thought. Because Filipinos speak English more slowly and clearly. That's why I came here. What is the strangest thing that has happened to you while you were traveling? Actually I didn't like going out alone before because I was really shy. I didn't even go to the clothes shop alone. When I go to the shop, some staff would talk to me. That's why I am always with someone. But through travel, I changed. Now I can do many things by myself. I couldn't imagine I would enjoy traveling despite being by myself. The most memorable? Making Japanese friends. Even if we are together only one day, we would be best friends just because we are from the same country. I could make many friends through travel. So meeting new people makes good memories for me. And it will continue even when I come home to Japan. What's the strangest food you have ever eaten? Where was this? Of course. 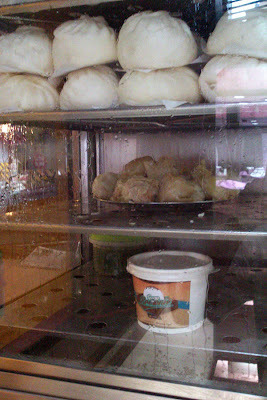 Balut in the Philippines. 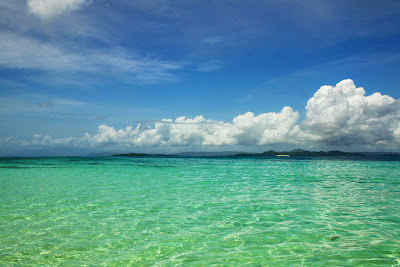 Note: Island hopping in Siargao can be done in half a day. Magpupungko can also be visited in just half a day. I usually don't do Amazing–Race–paced trips so I spent a day for each. ...and how pocket holes were made. 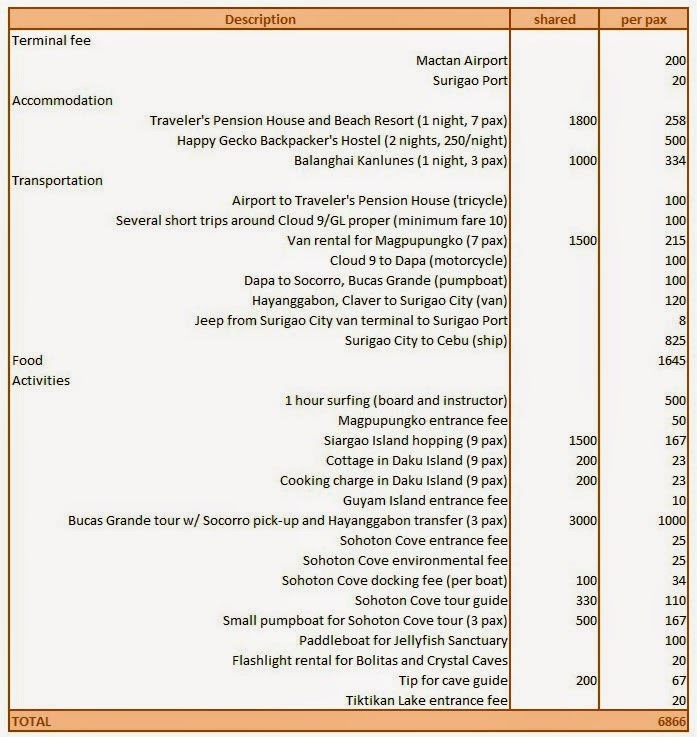 Note: I did not include the airfare from Cebu to Siargao. I got the ticket at a promo price. Regular one way airfare starts at around Php1200. 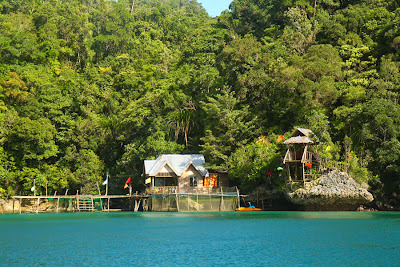 Our sole purpose of going to Bucas Grande Island was to see Sohoton Cove and its neighboring lake and caves. There were already about half a dozen groups and we had to wait our turn for the tour. Pumpboats have to wait at the Visitor's Center and guests have to transfer to a smaller pumpboat for the tour. 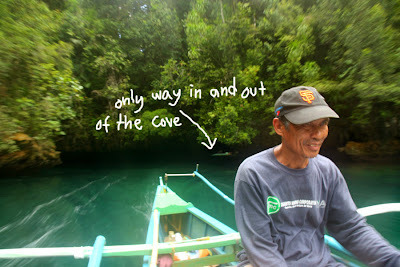 Only small pumpboats can get into the cove because the entrance to it is through a low–ceilinged cave. 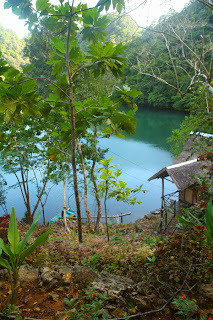 Sohot is a Visayan word meaning to pass through a small opening, thus Sohoton Cove. 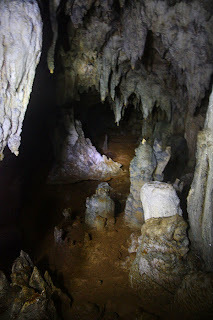 The tour visits two caves: Hagukan Cave and Magkukuob Cave. 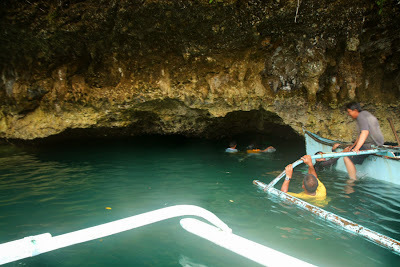 Guests are encouraged to swim inside Hagukan Cave. For those who don't know how to swim, lifevests can be rented at the Visitor's Center or trust your guide to lead you into the cave. Hagukan Cave is named for the snoring sound the water makes when it hits the opening during high tide. Haguk is Visayan for snore. One would expect the inside of the cave to be pitch black, but it actually isn't. 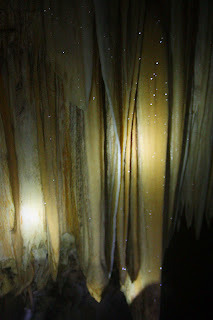 Too bad I didn't have a waterproof camera to take photos of the inside of the cave. It is a short walk to get inside dark Magkukuob Cave (not to worry, your guide is a Boy Scout, he'll have a flashlight with him), then a bit of climbing to get to the exit. It is also known as Diving Cave because you have to jump off a platform to exit. You can actually trace your way back to the entrance but it's easier to just jump off than navigate your way down the slippery cave. After visiting these two caves, we were taken back to the Visitor's Center to transfer to a paddleboat for the Jellyfish Sanctuary. Only one guest per paddleboat and paddler/guide. I asked for an extra paddle from my guide and started paddling. My paddling was taking us anywhere but the jellyfish lagoon. I eventually just hummed a tune and pretended to paddle. 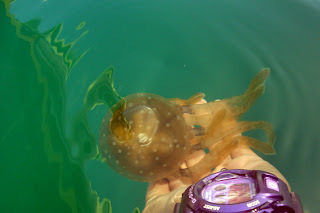 The jellyfish are stingless. 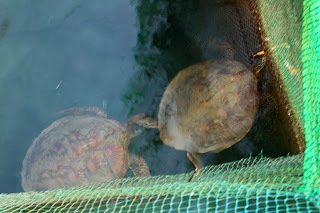 One can touch them but not take them out of the water for more than a minute or they die. The jellyfish appear from March to July and are abundant around April. It is best to go to the sanctuary when the sun isn't too high up—the jellyfish hide when it's hot, at least that's what my guide said. Swimming is strictly prohibited at the sanctuary. After Sohoton Cove and the Jellyfish Sanctuary, we proceeded to Tiktikan Lake, Bolitas Cave, Crystal Cave, and a newly explored cave, Tundan Cave (thanks Glen for the info). All three caves are in the same area. 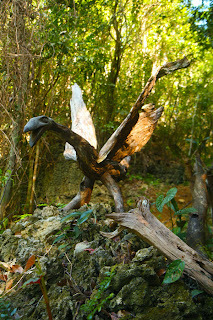 After the lake, we boarded our boat and were taken to another area where Bolitas, Crystal, and Tundan Caves are. To explore the caves a guide and flashlights are required. No guide fees but tips are always welcome. Flashlights can be rented for Php20. The first cave we went into was Tundan Cave. It took us almost an hour in and out of it. There were portions where we had to crawl, tuck our stomachs in, and wriggle our way through. After this exploration we were drenched in sweat and covered in mud. Crystal Cave was easy to explore. No wriggling and shrinking yourself required. After the two caves, where we saw shiny, sparkly formations inside, we didn't bother going into Bolitas Cave (the entrance to Bolitas is a narrow passage by the mouth of Crystal Cave). It was already dusk when we emerged from Crystal Cave. We were grimy, muddy, stinky, and exhausted. For Php3000 we were picked up from Socorro, taken on a six-hour tour of caves and lakes, and, the next day, taken to the mainland (Brgy. 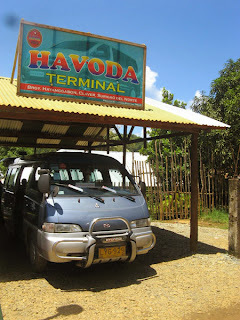 Hayanggabon, Claver, Surigao del Norte) to catch a van (1.5 hours, Php120) going to Surigao City. 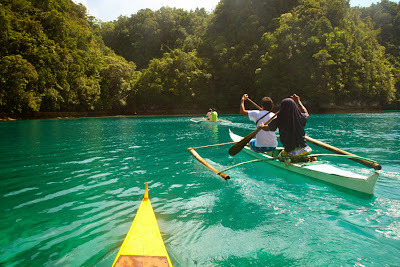 One can explore Sohoton Cove in Bucas Grande Island as a day trip from Siargao. Since we intended to stay a night in Bucas Grande, we passed up on the 4500-peso day trip. 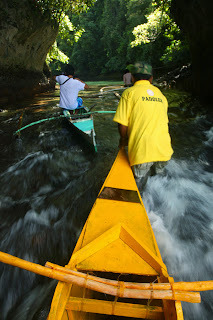 Instead, we took the passenger boat from Dapa in Siargao at 8AM to Socorro in Bucas Grande. 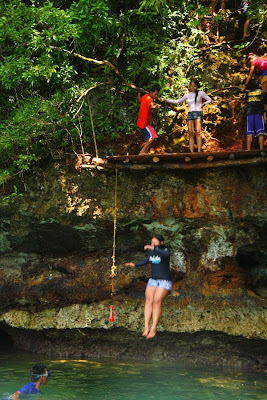 The 1.5-hour boat ride to Socorro costs Php100. We already had a contact in Bucas Grande who would pick us up at Socorro. Otherwise, we could have just looked for a pumpboat in Socorro that could take us to Sohoton. 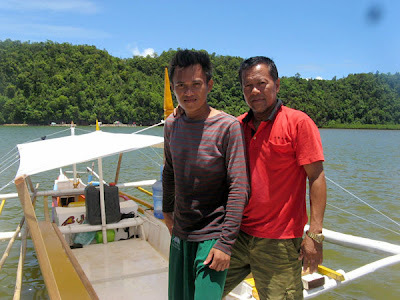 From Socorro, the father and son team whom we hired to take us to Sohoton Cove first took us to Balanghai Kanlunes where we would be staying in an open cabana for a night. 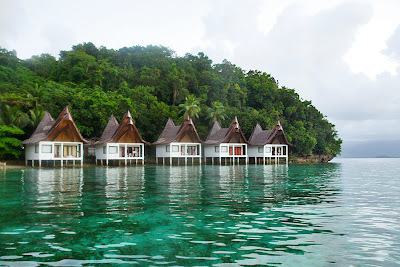 There are about ten open cabanas for rent (Php1000 a night) at Balanghai Kanlunes. Each cabana has a mattress, pillows, blanket, mosquito net, and tarp (in case of rain). 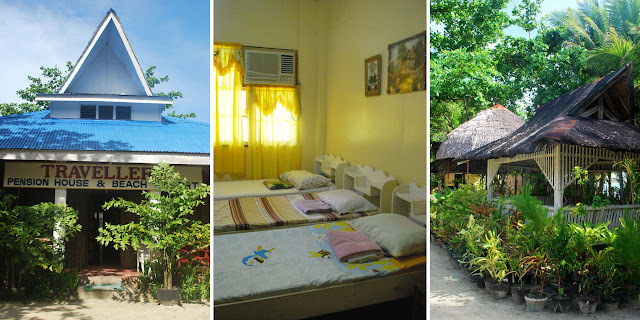 There are also air-conditioned cottages for Php2500 per. Two toilets and showers are shared by ten cabanas. When the toilets/showers in the cottages are in use, the water at the common toilets/showers stops flowing. Our skin would glitter with salt before we get the chance to take a shower. If you do not bring food, then the only option is to eat at Balanghai Kanlunes's own restaurant. The food there would cost an arm and a leg: our lunch of two kilos of fish (which looked like it was only a kilo) and rice for three persons cost us Php900. Drinking water though is free. On the upside, the best part about staying at Balanghai Kanlunes is getting lulled to sleep by the crashing waves, having everlasting aircon(tinuous) in the cabana, and then waking up with a view. So we got robbed by two kilos of fish, grew salt glitters on our skin, and snoozed in the cabana. What else happened to us at Balanghai Kanlunes? We saw the clear blue sea and the islands from the window of an empty wooden cottage on a hill on one side of Balanghai. We appreciated the calm and quiet of a smaller beach on the west side. 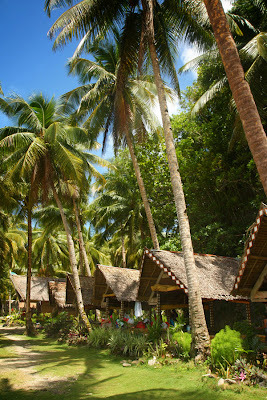 And took a photo of the cottages of Club Tara Resort. Guests of Balanghai Kanlunes can go sight-see at Club Tara Resort for free (non-Balanghai-guests have to pay an entrance fee of Php20). A pathway behind Balanghai leads to Club Tara. We did not take this path, instead dropped by during our boat tour. 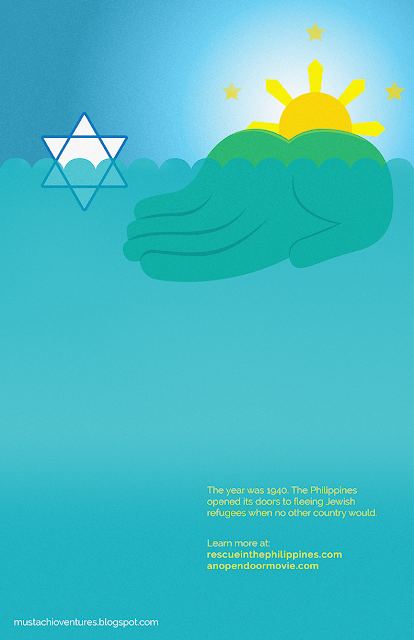 ...a thousand Jewish refugees came to the Philippines on the brink of the holocaust in Europe? This daring move is credited to a handful of people including Philippine President Manuel Quezon. Sadly, Quezon is not remembered well for this heroic deed. 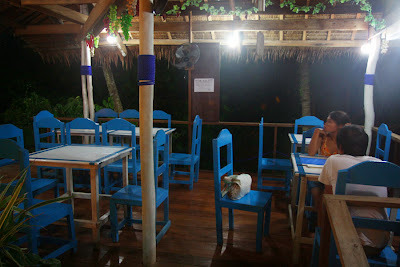 Here's another place we tried in Siargao: Skales Greek Restaurant, a hundred or so meters from Happy Gecko Backpacker's Hostel. Quiet and deserted, it did not deter me from dragging along my friends. I have only tried Greek food once, years ago, and I wanted to reacquaint myself with such cuisine. From the road, only the restaurant's sign that is nailed to the nipa roof of a waiting-shed-kinda-structure can be seen. We had to go up a flight of concrete steps to go to the small open-air dining area with white tables and blue chairs. Breakfast at Skales Greek Restaurant ranges from Php 45 to Php 130; salads Php95-190; appetizers Php70-150; soups Php85; main dishes Php110-210; desserts Php50-85; and drinks Php35-65. They also have Filipino dishes for Php115-210. Kotopoulo me gemisto is, according to the menu, "Greek style chicken in red sauce." It is served with rice, potato, or pita bread. After one bite, my friend said, "I could have made this myself." Politiko psari santo forno is "Greek style baked fish with rice or potato." I would have loved this dish if it wasn't too salty. Now I wonder what they mean by "Greek style." Is it blah or salty? 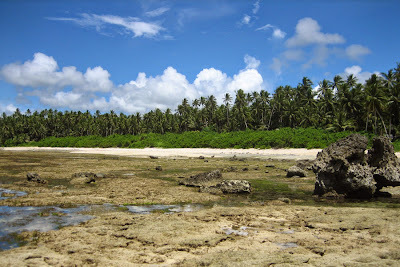 Siargao Island is not all surfing and reef breaks. Sandy beaches can be had too. 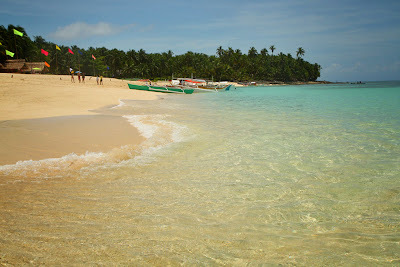 Get away from Cloud 9 and find the beach in General Luna town proper. It is clean and inviting. This is also where pumpboats can be hired to go to the three nearby islands. The rate is Php500 for each island. Pumpboats can carry up to 15 people. Don't be too hasty in tearing off your clothes as you near Naked Island...the island is naked, not the people. Naked in that it has no trees, no cottages, just a big mound of white sand. You will get scorched here. And fast. Daku is Visayan for big. From the name itself, you can guess it's the biggest island of the three. You can bring along food to be grilled and cooked. People here are enterprising. They can cook for you for Php200. They can also let you borrow plates and utensils. 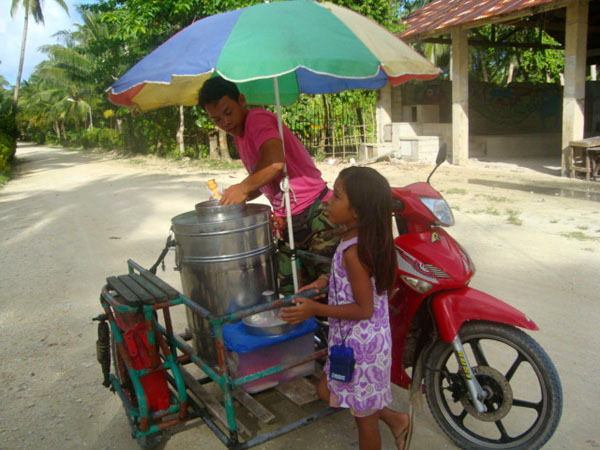 And will even offer to get coconuts for Php20 apiece. Open cottages for day use can be rented for Php200. There are also cottages for overnight stay (forgot to ask how much). Bring a volleyball, they have a net set up ready for a game. If you can't live without surfing, take your board with you. There's a surf spot near Daku Island (just ask the boatman to bring you there on the way to Guyam Island). One side is all sand, the other side all rocks. And in the middle are a bunch of trees. A ten-peso entrance fee per person is collected here. Even if you just dock and don't step on the island. From Siargao, you can also hire a pumpboat to take you on a day trip to Sohoton Cove in the island next door, Bucas Grande Island. Take heed, the water gets very choppy from Siargao to Bucas Grande. Magpupungko seven years ago: I clearly remember arriving in a place surrounded by wild grass, bushes and trees. We picked our way through the bushes and arrived at a rocky beach. The tide was out, just the way we wanted. We were free to roam and find our way to the swimming hole. No entrance fees. No directional signs. No man–made structures. When we arrived at the pools, there were a handful of locals enjoying the natural pool. The pools were calling. And I heeded its call. But not before shamelessly putting on the arm floaters for kids that we had snatched from my friend's house (it was his nephew's floaters). Call me a sissy. But I was a sissy who was happily and lazily floating, while the others were treading water. I remember seeing a sea snake and, in fright, hastily scrambled up the sharp rocky edge, scratching my knees in the process. It was either get skinned or get bitten. I picked the former. Magpupungko now: A fence has been erected and bushes have been cleared. A booth, where a man collects an entrance fee of Php50 from every person who wants to go to the beach and the pools, stands guard at the gate. A concrete stairway off to the side has been built to give visitors easy access to the natural pools. 2013. Cottages, fences, and a collection/tourist assistance booth have replaced the bushes. But the natural pools remain as I remember them years ago... beautiful, clean, clear. This time I ditched the arm floaters and brought a snorkel and mask which I found has given me confidence to swim in deep waters... just cause I can breathe. I wasn't born a fish. And, yes, sea snakes are still around, but now I have the courage to just stare at them from a few feet away and not scramble away in fright. How did we get to Magpupungko? The ride to Magpupungko is usually by habalhabal, and the lowest price you can get is Php700 for two passengers. We were lucky we met Agnes, the owner of La Isla Siargao Bar and Grill, on the first night. During the course of our conversation, we mentioned we wanted to go to Magpupungko the following day and wanted to know where to rent a van or some motorcycles and around what time the tide would go out. (The rock pools, of course, only appear when it's low tide.) She offered to take us there using their van for only Php1500. We were seven and a van would be perfect. What a deal! The road to Magpupungko when passing on the east straight to the municipality of Pilar is mostly loose soil, or mud during wet days. Though it is the shortest way to Magpupungko from General Luna, it was slow going because of deep muddy roads. Thankfully, Mike, the husband of Agnes, expertly maneuvered through it. We circled on the way back, taking the mostly concrete roads of the towns of San Isidro, Del Carmen, and Dapa. Oh, if you're wondering why it's called Magpupungko, it's because of that huge rock that has been sitting on a smaller one for years. Pungko is Visayan for sit. The first afternoon in Siargao was spent eating cones of rocky road strawberry ice cream (strawberry ice cream peddled on the rocky road of General Luna), going on a joyride with the ice cream guy (he let us hitch a ride to Cloud 9, thanks Mr Ice Cream Man), and trying to surf (Php500/hour for board and instructor). After all these activities, we headed home to Traveler's Pension House and Beach Resort to shower and have dinner. The pension house had no restaurant. Too hungry to look for a place to eat, we stepped into the first restaurant we saw. 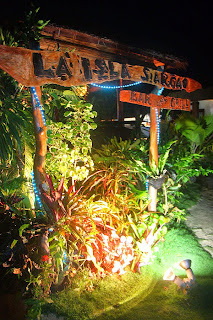 The restaurant nearest to the pension house happened to be La Isla Siargao Bar and Grill. We stepped into La Isla with bare feet. Slippers and sandals were parked on the wooden steps of the elevated restaurant, we followed suit, of course. It was a nice, laid back restaurant with wooden floors, a bar at the center, some tables and chairs on the side, and a low table in the right corner where guests can sit on the floor and stretch out their legs. The menu lists a bunch of seafood dishes for less than Php150 each. Being so used to stingy portions in Cebu, especially of seafood, I had to ask the server how many shrimps were in the spicy garlic and pepper shrimps. I was skeptical when the server said it would contain more than eight pieces of shrimp. Less than eight or more than eight shrimps, the name sounded so good. Spicy garlic and pepper shrimps it is. Friends chose the deep fried seafood and sweet and sour shrimps. Each of our dishes comes with rice. I was delighted when the plate was set in front of me. It did look like it had more than eight shrimps. In my disbelief I had to count them. Indeed, it was more than eight...fifteen to be exact. On top of the generous serving size, it was fresh, cooked just right, and tasty. My friends liked their food, too. The three of us agreed that, of the three dishes, the sweet and sour shrimps was tops. On top of that, a plateful of watermelon slices arrived on our table. Courtesy of the owner, Agnes. How generous! On the second night, it was La Isla again. Seafood for less than Php150, I just couldn't resist. This time I had the spicy fish with orange zest and travel buddy had the kinilaw. The orange did give it a twist. And the kinilaw? I don't really eat kinilaw, but, hey, this was really good. It did not feel nor taste raw. We usually don't go to the same restaurant twice because we want to try as many different places during a trip, but this was definitely worth going back for. You probably know that Siargao Island is the "Surfing Capital of the Philippines" and you probably want to ride its waves. If you're not a surfer or a surfer-wannabe, you probably just want to laze around in this laid back little Southern Philippine island. 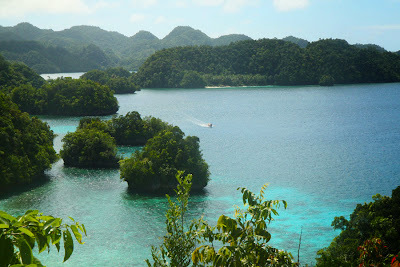 Or see its neighboring islands/islets and its white sand beaches. 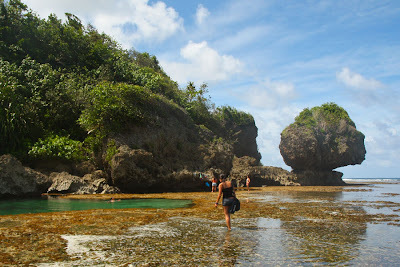 Or swim in Magpupungko, that natural rock pool in the town of Pilar. Or maybe you're just bored and have nothing else to read but this little blog. 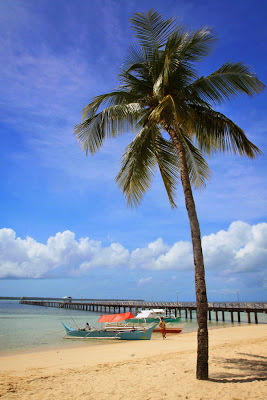 Whatever the case may be, I will point you to Siargao. 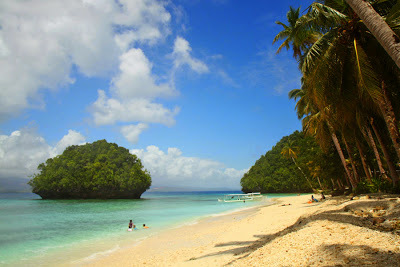 Siargao Island can be reached by flying or by floating. You don't have to do the flying or the floating yourself, of course. 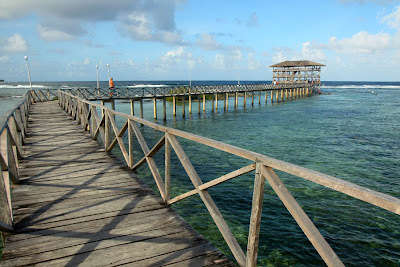 By air, Cebu Pacific flies direct to Siargao from Cebu. (It is the only airline that flies to Siargao as of the moment.) The airport is in the municipality of Del Carmen, about 30 kilometers from General Luna, where the surfing action is. By sea, you can get yourself to Dapa Port in Siargao Island by taking the fastcraft or roro (Php170-250) from Surigao City. 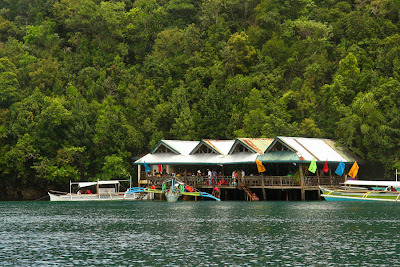 Or, if you're coming from Socorro in Bucas Grande Island, by a 1.5-hour pumpboat ride (Php100). 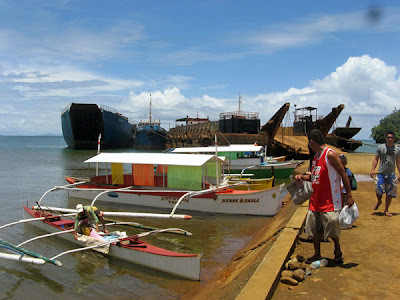 Dapa Port is about 15 kilometers from General Luna. 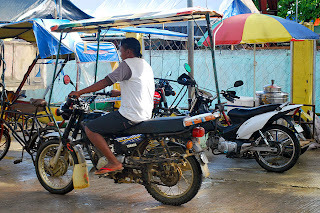 Transportation around the island is limited to tricycles and motorcycles. (I saw a few jeepneys at Dapa Port but their route was, I am sure, not General Luna.) 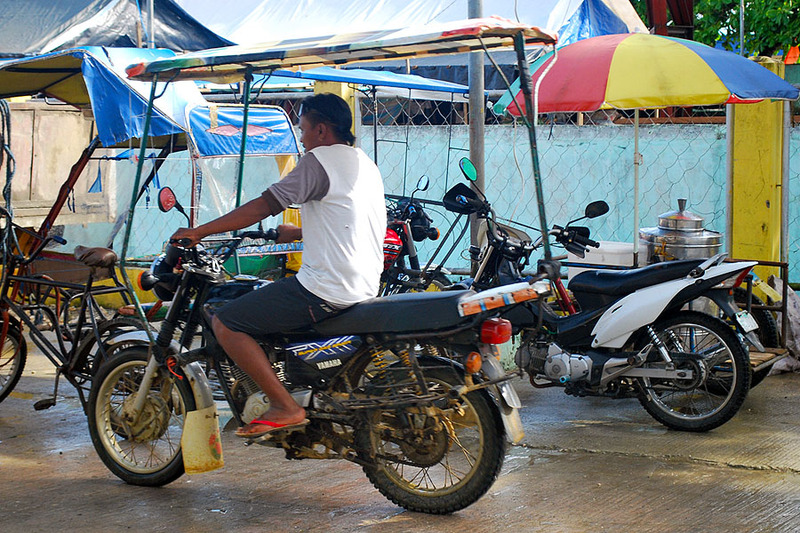 Tricycle routes are from town to town and there aren't many that go beyond the town proper's limits. It is easier to go around by motorcycle. The fare from the town proper of General Luna to Cloud 9 is Php20. And the fare around the Cloud 9 area is Php10. 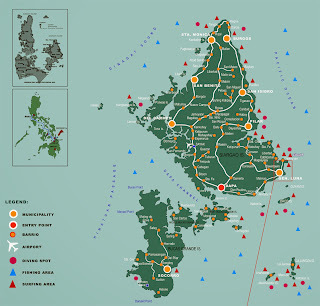 There are many inns and resorts, concentrated mostly in General Luna (both town proper and Cloud 9 area). 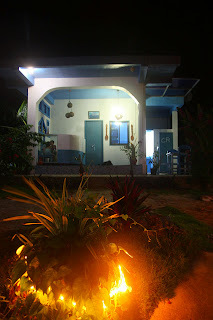 We stayed in Traveler's Pension House and Beach Resort (located between the town proper and Cloud 9) the first night. 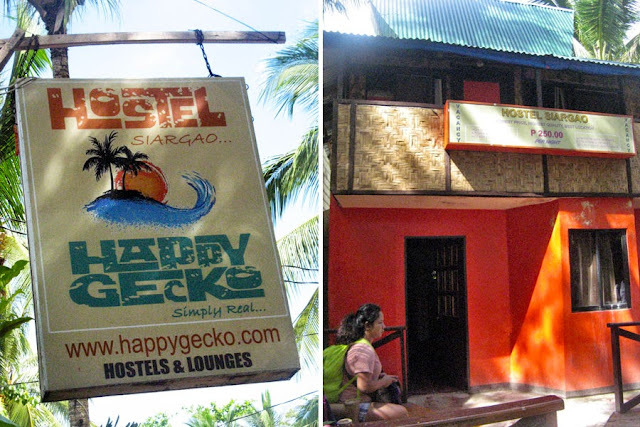 Then by a majority vote, moved to Happy Gecko Backpacker's Hostel which was just a one-minute walk to Cloud 9. 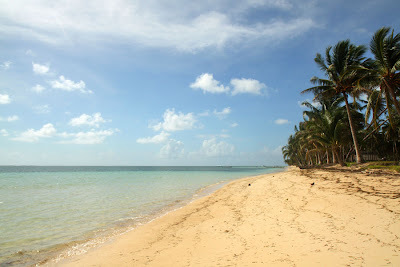 If you're in Siargao looking for a place with a sandy beachfront then it's Traveler's for you. Rooms are affordable. We got the AC room for 6 persons for Php1800. The owner didn't charge us for the extra person. 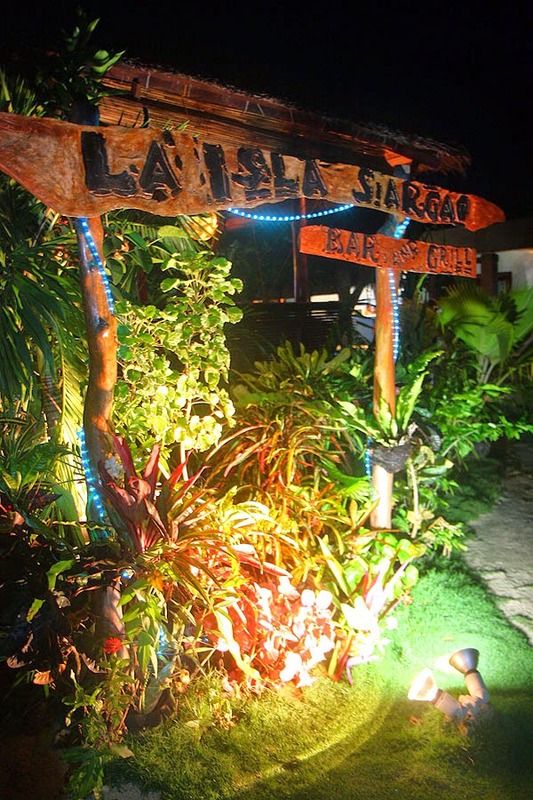 It's just a few steps from La Isla Grill Siargao Bar and Grill, which serves surprisingly affordable good food. 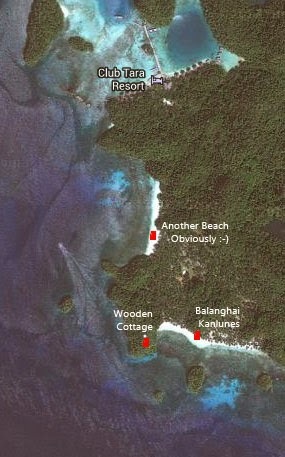 If you're in Siargao for surfing, the action is at Cloud 9, 2.5 kilometers from Traveler's. The room has its own bathroom, but the door to it didn't have a lock. The bathroom looked like it needed a good scrubbing. Bed sheets looked like it needed washing—thrice. The room was dirty. We had to borrow a broom to sweep away all the sand and trash hiding under the beds. 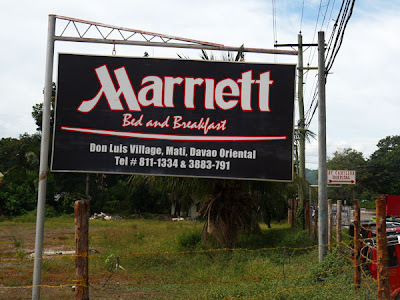 It's just Php250 a night. The rooms have its own toilet and bath. Each bed has its own locker. Right beside the hostel is a small eatery which rents out surfboards (Php200/hour or Php500/day), too. The hostel has a small kitchen if you want to cook your own meals. Cloud 9 is just a minute away by foot. Rooms are dorm-type. If you're not comfortable sharing a room with strangers then this is not the place for you. The lockers have no locks... you have to provide your own. No air-conditioner but an electric fan is provided. This is okay if your bed is by the window. If your bed's in a corner with no windows, it's going to be very warm, even with the fan on (unless the fan is facing you).